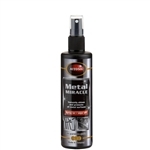 Autosol Metal Miracle offers metal cleaning and protection in a single product. It works wonders on metallic and wooden surfaces alike, creating a matte smooth finish with anti-fingerprint agents that provide long lasting protection. Metal Miracle is formulated especially for brushed surfaces and for use in food preparation areas. The Autosol Bluing Remover is specially formulated to remove bluing and heat caused discoloration. It removes the burn from titanium and stainless steel motorcycle tips, car exhausts, stainless steel welds and other industrial metals and restores them to their original shine. The blend of chemicals and abrasives removes even persistent discoloration. Corrosion inhibitors eliminate the risk of damage to unstained surface areas. Easy to dispense kit cleans thoroughly and freshens up natural leather, vinyl, and synthetic leathers. Increases depth of color and elasticity, while creating a matt shine. Thanks to an improved recipe, the leather care emulsion leaves a protection layer that prevents brittleness and abrasion, but allows the leather to breathe. High quality oils preserve the leather's natural characteristics. Note: Not suitable for suede. The kit is designed to restore clarity to headlight lenses that have become yellowed, cloudy or hazed over time. By restoring clarity to the lens you improve the performance of the headlight and enhance the appearance of the vehicle. Headlight lenses have a hard surface layer (either Polycarbonate or PMMA plastic), or an Ultraviolet (UV) resistant coating on the outer surface of the lens. Once a lens has been degraded by sunlight or UV light, it becomes yellowed and cloudy. AUTOSOL has developed a process to restore a headlight's clarity. With the AUTOSOL kit, you can either apply the polishing paste by hand or use a 1,200-1,600 RPM drill. A higher RPM drill can generate excessive heat and cause damage to the headlight lens. This kit effortlessly and thoroughly cleans both indoor and outdoor plastic surfaces. It removes nicotine stains, shoe scuff marks, and gives a new gloss finish to tired surfaces. The kit also provides a protective film that prevents brittleness, graying and ageing and has a deep conditioning formula which creates a silk matt finish.